Leo Lewis presented to a sold-out audience at yesterday’s BMA Colorado roundtable in Denver on the topic of: Start Here! First Steps in Data-driven Strategic Marketing. Leo discussed (and addressed some good audience questions about) the advantages of conducting a thorough data- and information-driven Internal and External Situation assessment and how doing so assists a marketing executive with business opportunity identification, marketing goal development, and product-market strategy. These are all critical steps prior to conducting market segmentation. 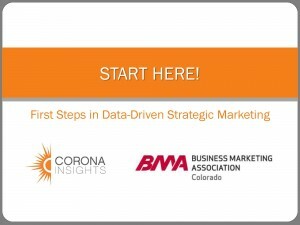 See a summary of the marketing process as it is informed by Corona’s data, insights and strategy. Click here to view the presentation (pdf). Feedback from attendees was positive. A few responses are presented below (with permission). I just wanted to say thank you for the nice presentation this morning! You provided a lot of excellent content in a very short amount of time! Great job! I will be looking out for the next event! Thanks for all you do! (I) wanted to drop you an email to thank you for putting together the presentation this morning. It’s refreshing when marketing is spoken about from a holistic organizational level as opposed to a silo within an organization. Well done! Thank you to all who attended, and we’ll look forward to our next opportunity to partner with the BMA to provide you meaningful insight into your strategic marketing. Previous PostChangemakers and the Synergistic Business ModelNext PostHappy Anniversary, Leo!